Maxpedition's Proteus Versipack is a super versatile bag that easily and quickly converts from a fannypack to a hand-carried case depending on your needs of the moment. You can even lash it to ALICE or MOLLE gear. Maxpedition crafts this pack using lightweight 1000 Denier ballistic nylon material with a coating of DuPont Teflon® and a triple layer of polyurethane, making it resistant to water, dirt, and abrasions, as well as easy to clean. The Proteus also features high tensile strength nylon webbing and thread, and the stress points all have reinforced double stitching, "Box-and-X" stitching, or bartacking. The Versipack includes sturdy YKK zippers and tracks with paracord zipper pulls, quiet UTX-Duraflex nylon buckles, taped and finished internal seams, compression straps, and #AS-100 closed-cell foam padding to protect your gear. 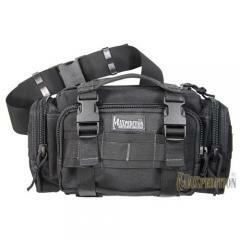 This buttpack will also interface with Maxpedition and PALS webbing using a pair of 5" TacTie® (sold separately). Main compartment dimensions: 9" x 6" x 3"
Frontal compartment dimensions: 8" x 5" x 1.5"
Side compartment dimensions: 6" x 3" x 1.75"
Waist belt adjusts up to 49"